Handcrafted Black Cultured Pearl Stud Earrings, "Black Nascent Flower"
Luminous pearls in natural dark grey evoke swelling floral buds, nascent flowers about to burst into bloom. Working in sterling silver, Marianela Vargas crafts classic pearl stud earrings with a subtle floral theme. 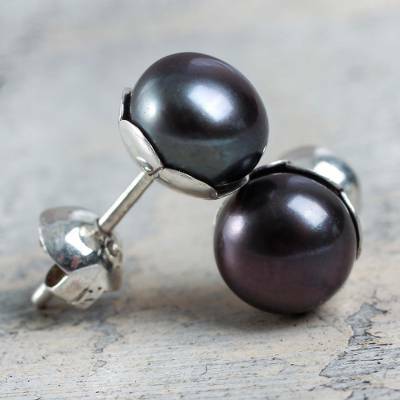 You can find cultured pearl stud earrings 'Black Nascent Flower' by Marianela Vargas in jewelry categories such as Birthstone Earrings, PEARL Cultured Earrings, Sterling Silver Earrings and Stud Earrings. Enjoy exploring these sections for other Novica treasures.